Our campaign kicks off Oct. 8–pledge to join us! 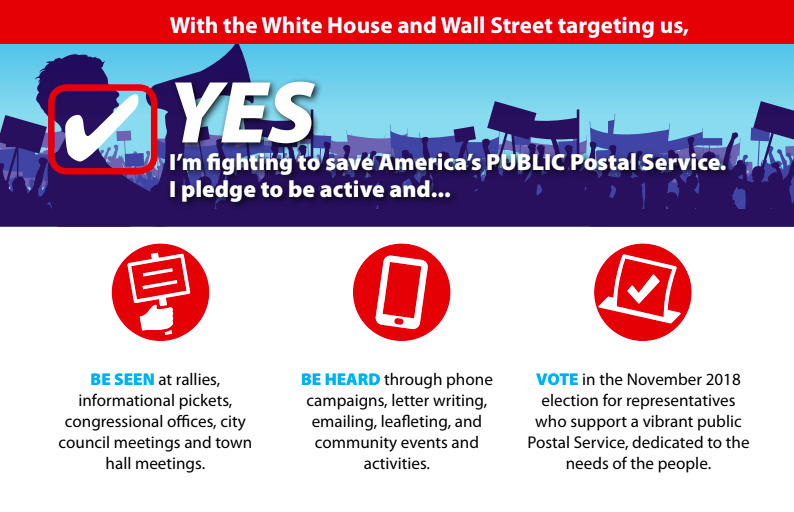 Beginning October 8, we’ll be taking action in person, online and on the phones to defend our PUBLIC post office and preserve this national treasure. Click here to learn more about our first actions and download flyers for your worksite and community!. Pledge to take action by filling out the form below, and we’ll keep you posted on ways you can help stop the privatizers from selling off the USPS. 07/23/2018 – On Wednesday, July 18, the APWU and our allies won a big victory by defeating an attempt to prohibit the Postal Service from expanding financial services. In a vote on the floor of the U.S. House of Representatives, an amendment to a government appropriation bill (H.R. 6147) offered by Representative Patrick McHenry (R-NC) was rejected by a bipartisan vote of 212 to 201. The APWU greatly appreciates the bipartisan support from lawmakers who voted down this proposal. The amendment would have prevented the Postal Service from using its existing legal authority to enhance its offering of basic financial services – including domestic electronic money transfers, bill payment services, expanded check cashing, and expanded international money transfers. Not stopping there, it also preemptively banned future USPS innovations that have not already been approved by Congress. Earlier versions of the proposal even meddled with APWU collective bargaining, as it attempted to overturn the agreement reached in our last round of contract negotiations with the USPS to pursue expanded postal services. The banking industry lobbied hard in favor of this amendment, joining with anti-government organizations like Americans for Tax Reform and the Heritage Foundation. These are the very groups that are determined to privatize our public Postal Service. The commitment of the National Association of Letter Carriers, National Postal Mail Handlers Union, and National Rural Letter Carriers’ Association, as well as our allies in the Campaign for Postal Banking, the AFL-CIO, Americans for Financial Reform, and Take on Wall Street, won the day. “Only through the collective work of all our allies in the public interest, united in solidarity, could we defeat this attack,” Director Beard emphasized. When Representative John Curtis (R-UT) – who was serving as Acting Chair at the time – called for a voice vote, it was clear the majority opposed the amendment. Despite this, however, he ruled that the amendment had been adopted. Recognizing the strong bipartisan opposition to the amendment and that the Acting Chair had ruled incorrectly, Representative Kaptur demanded a recorded vote. When the votes were counted, she was vindicated as the House of Representatives rejected the amendment by a roll call of only 201 in favor and 212 opposed. The Postal Service is in a unique position to provide basic, affordable, non-profit financial services via its existing infrastructure, as well as a host of attentional expanded services. These services provided by the USPS could help struggling families throughout the country achieve financial stability and strengthen the USPS mission to serve the public.